Place the dog walking flyer everywhere you can to gain more potential clients. 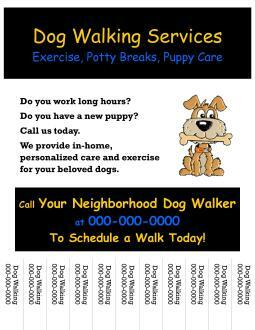 The dog walking flyer is created in Microsoft Publisher. It is sent as a pub, jpg and pdf file with instructions on how to edit with your business information. We can also send to you with your business information if you select for us to do so. Forms are an immediate download unless you would like them customized with your business information. If you selected to have them customized, they are sent within 3 business days or less. We do not ship the forms.